The present study describes the impact of light-emitting diodes (LEDs) on synseed germination and subsequent synseed-derived seedling growth of Curculigo orchioides, an endangered medicinal plant under in vitro conditions. Shoot buds regenerated on Murashige and Skoog’s medium (MS) containing 4 mg/l 6-benzylaminopurine (BAP), and 3% sucrose were utilized for encapsulation. Encapsulation was achieved by suspending the excised shoot buds into sodium–alginate gel matrix and dropping them into 100 mM CaCl2 solution. Synseeds thus produced were incubated under different light conditions. Among the various light treatments, irradiation of synseeds with blue LEDs (BL) strongly influences the growth of the synseed-derived seedlings. A significant increase in length, fresh and dry biomass of the synseed-derived seedlings was observed under BL as compared to light treatments of conventional fluorescence lamps (FL) and a combination of blue and red LEDs with equal proportion (BRL, 1:1). The trifoliate leaf area and weighted density of leaves were measured from the digital images of synseed-derived seedlings using MATLAB® 2013a Image Processing Toolbox. Image analysis of the synseed-derived seedlings also revealed the improved growth in terms of increase in trifoliate leaf area and weighted density under BL. Exposure to red LEDs (RL) resulted in poor synseed germination and severely retarded the growth of the synseed-derived seedlings. The leaves of synseed-derived seedlings grown under BL had higher chlorophyll a, carotenoid, total phenols, and flavonoid contents than that of FL and BRL treatments. The synseed-derived seedlings developed under BL also displayed enhanced levels of antioxidant activity. Ex vitro performance of the synseed-derived seedlings raised under BL was found to be better with improved plant canopy as expressed in terms of increase in trifoliate leaf area and weighted density than other light treatments. 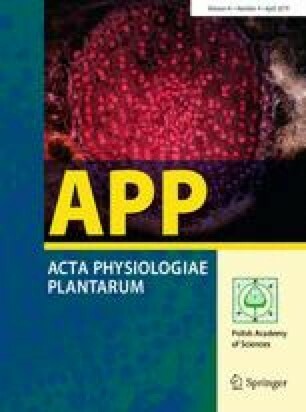 The present study for the first time demonstrates the potential of BL irradiation on encapsulation technology with the ability of direct conversion of synseeds to synseed-converted seedlings leading to the vigorous growth of the plantlets which may make the encapsulation strategy ideal for supply of healthy plant propagules for transfer to field conditions and germplasm conservation.